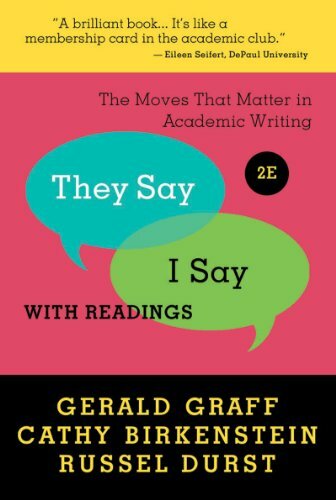 They Say / I Say demystifies academic writing by identifying its key rhetorical moves, the most important of which is to summarize what others have said ("they say") to set up one's own argument ("I say"). The book also provides templates to help students make these key moves in their own writing. This version includes readings that demonstrate those movesâand provide stimulating conversations for them to enter. The Second Edition includes an anthology of 44 readings that will provoke students to thinkâand writeâabout five important issues, including two new ones: Is Higher Education Worth the Price? and Why Does It Matter Who Wins the Big Game? Russel Durst , who edited the readings in this book, is Head of the English Department at the University of Cincinnati, where he teaches courses in composition, writing pedagogy and research, English linguistics, and the Hebrew Bible as literature. A past President of the National Conference on Research in Language and Literacy, he is the author of several books, including Collision Course: Conflict, Negotiation, and Learning in College Composition .